This dip has such a beautiful color. I am sure it tastes as great! Excellent looking chutney . This can compliment any kind of snack that you can think of. Great color. Delicious coriander chutney. Nice one. match made in heaven chutney! All time fav and handy chutney..
oooo i luv it with samosas ,bhajis or anythg...lovely colour. 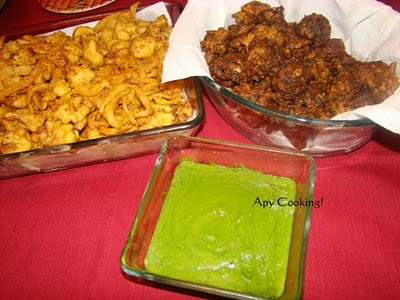 Mint chutney with pakodas... a heavenly combo! Hey Aparna.. Happy Diwali! Your party sounds like a fun evening! I'm sure the pakodas and chutney were a big hit! Yummy and delicious chutney.. looks perfect ! !